There’s a lot going on in this Fixed-it Friday photo, which was sent by Nik Pethis of RDL Supply (Div. of Cook & Boardman). A knob, lever, AND a mag-lock? And what’s with the stainless plates? Are they covering old vision lights or do you think they were “original equipment”? Field modifications to rated doors, no no’s! There might be a motion sensor (green bar) above the door to release the Maglok, and therefore tied to the fire system. Unless that’s not a motion sensor and just a status indicator. There must be a pull station and credential over-ride out of view. 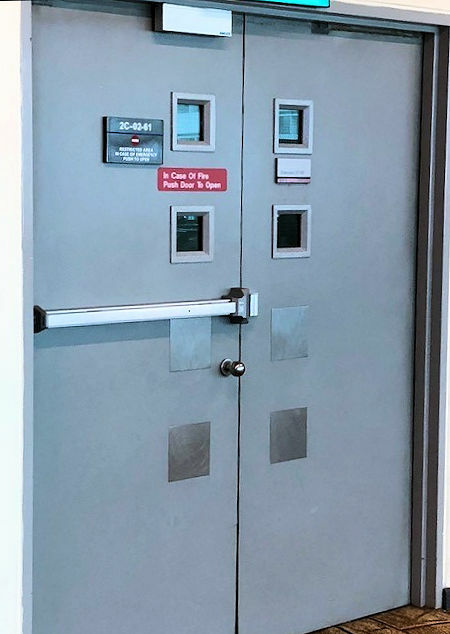 The panic-bar may have an integrated switch contact to release the Maglok for one touch egress, and since I don’t see any drop loop (which would be on the secure (this) side of the door), they may be using electrified hinges. I doubt any of this to be the case. The push-bar keeps the door latched for when the fire alarm deactivates the Maglok. The push-bar has the dogging feature (hole) and therefore MIGHT not be fire rated, as panic-bar equipment cannot be dogged-down capable in my area. The dogging mechanism may have been removed, still not approved as not rated for this purpose, and now modified. If the push-bar plate is a replacement from another unit, part substitution might negate it’s fire rating. The push-bar is not mounted at disability code height. The knob could be a dummy trim to pull the door fully closed. The Plates cover old windows, from better days. Knob is probably because there is no closer to pull the door shut to lock it.